Big block Chevy 454 with 550 Hp performance aluminum head engine combination can be custom designed to tailor to your specific needs. All engines can be custom painted to match your vehicle at your request. We can outfit your engine with the exclusive March Performance serpentine belt system. We can also assist you in choosing the proper transmission and stall speed converter combination for your vehicle and have it shipped directly to you as your performance crate engine is being built. 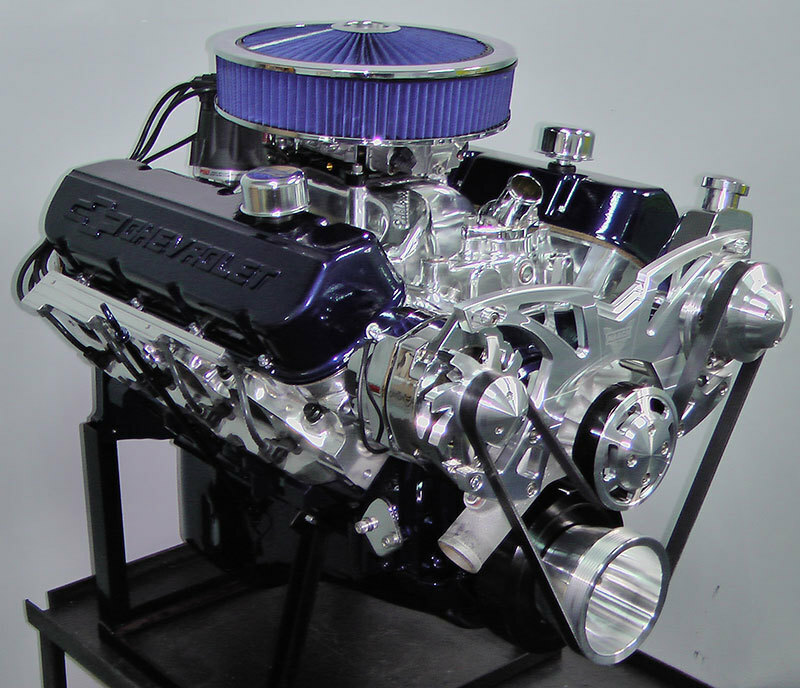 Custom Crate Engines takes great pride in all of our Chevy performance engines. Whether your vehicle is a Corvette, Camaro, Nova, Chevelle, or just an early 60’s muscle car, we are here to help design and build the engine combination to match you with your vehicle. Please browse our engine combinations listed below. Custom Crate Engines is best known for our precision custom designs. From that special built stroker engine, 383, 427, 502, 632 to that turn-key drop in ready crate engine, we strive to build custom engines at an affordable price. Take a look at our crate engine videos. I guarantee we have the best engines on the World Wide Web. Give us a call today and ask for Doug or Steve and we will be happy to answer any of your questions. PROFORMANCE UNLIMITED INC. RESERVES THE RIGHT TO MAKE CHANGES IN DESIGN OR TO MAKE ADDITIONS TO OR IMPROVEMENTS UPON ANY OF ITS PRODUCTS AT ANY TIME WITHOUT INCURRING ANY OBLIGATION WHATSOEVER TO INSTALL THE SAME OR IMPROVEMENT UPON PRODUCTS PREVIOUSLY MANUFACTURED. OCCASIONALLY DEPENDING ON AVAILABILITY, PARTS MAY BE SUBSTITUTED THAT WILL NOT EFFECT PRICE, PERFORMANCE, APPEARANCE OR QUALITY OF THE PRODUCT.